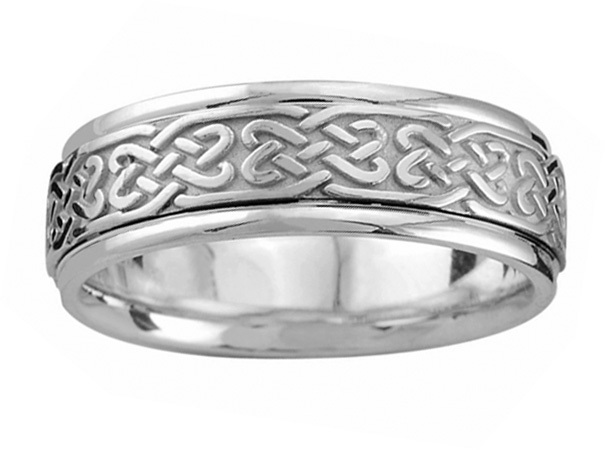 A gorgeous sterling silver sets the stage for this silver Celtic heart knot wedding band from Apples of Gold Jewelry. With a comfort fit design band and a beautiful, heart shaped Celtic knot knot design going around the entire band, this playful and sweet wedding band is crafted in .925 sterling silver. Perfect for men and women and available in a variety of widths from 6mm through 8mm, this ring is pictured here in a 7mm width. The slight shine of the silver and special details of the ring make it a fantastic choice for a wonderful wedding day. We guarantee our Silver Heart-Knot Wedding Band Ring to be high quality, authentic jewelry, as described above.